Trade: TBD | Who’s Your Haddy? Andrew’s thoughts: So TBD traded four bucks to move up and draft San Francisco Giants outfielder Heath Quinn. I’d never heard of Quinn, so obviously I’d rather have the four bucks, but I trust and defer to TBD’s prospect judgment here (and Beach Bum said he was poised to take Quinn, so it’s a good thing TBD jumped to get their guy). Jordan’s thoughts: I just like that deals like this are getting made now. I feel like $4 would have bought the moon last year, I think the market has corrected itself a bit. Hooray for that. Nobody wins or loses here. Jordan’s thoughts: Aaron Judge got his chance last year and was short of inspiring. He’s still a prospect and he does carry some level of potential that is very enticing. Grant Holmes is in the same category of prospects. That category being the catch-all level 40-45 future value grade group. These guys exist. They have good qualities. They have one or two talents that could truly make them stars. Unfortunately, they have other levels of talents that are more likely to hold them back, causing them to potentially be less than valuable. These kinds of trades are weird. Matt Holliday is a great hitter, aging, and just signed a fantasy hitter’s favorable deal. There’s a lot to like. His floor is generally high as long as he actually sees the field. His ceiling is high-ish, but that is also held back by how many games he plays. The keeper price for Holliday is a good buy. I think he’s 100% kept at that price for the next two to three years, short of some dramatic fall off. Cutting him in the end or keeping him for a year too long is hardly a penalty here. That makes him quite valuable to me. Sure, could either of these prospects that Bailey sent turn Bailey’s decision into regret? Absolutely. The fact that Dan got two of these kinds of guys who are close/in the majors, is a bit surprising. In a vacuum I’d rather have Holliday, but given the situation for both teams, it is hard to come away with an opinion other than liking the deal for both teams. Losing Holliday doesn’t hurt Beach Bum all that much and the prospects could be useful. Adding Holliday helps Capital City a lot, and losing the prospects that are (at this point in our dynasty) easily replaceable, isn’t much pain to suffer. Andrew’s defense: I like Matt Holliday a lot. The biggest question mark with him, really, is health. He’s old too, but he should mostly just DH now in a hitter friendly park. He had a solid .335 wOBA in his 426 plate appearances last year. If he can simply duplicate that, he’ll be good for me in LF, as it’s a fairly shallow position. And keep in mind, he did that despite a .253 BABIP and a really good looking batted ball profile (38.5% hard hit rate). If he just has neutral luck, he should hit that .355 wOBA Steamer has him pegged for. For Dan, he sheds one of his many LFs and adds a couple promising young guys, one of which (Judge) plays RF, so that fills a need. Judge’s power is prodigious and should play up at new Yankee Stadium, but he also struck out 44.2% of the time last year. Small sample, sure, but the K’s have always been a concern. I wasn’t overly concerned about them personally (for fantasy, a strikeout and a ground out are the same, so whatever), but it just means his floor is a little lower than I like and it could jeopardize his playing time. Not a bad bet for Dan. And Grant Holmes is just sort of an interesting grab. He’s an Oakland A (for now), so maybe Beach Bum was being a bit of a homer. Either way, Holmes is a top-100 prospect on most lists and profiles as a middle of the rotation guy. In our format, that’s alluring. What’s Going On Down in the Minors? We are getting close to the Super Two deadline, which FanGraphs explains here. That means that teams will start calling up some of their more talented prospects from the minor leagues. I went and got all the stats from MILB.com from all AA and AAA leagues and used our scoring system to calculate which players were having the best seasons. I then downloaded the list of all players from Fantrax to see which of these players were owned and by who (whom?). 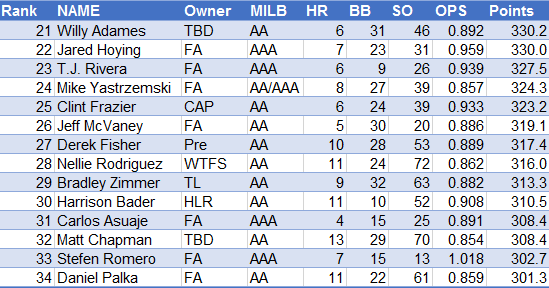 Musgrove, Mengden, Herrera, Jason Wheeler, Ben Lively and Aaron Wilkerson have been impressive in both AA and AAA. Making 300 points the cutoff again, I found 34 hitters in the Minor Leagues compared to 57 in the Majors. TBD owns four of the top 36 bats – Peter O’Brien, Tyler O’Neill – 187th, Willy Adames – 115th and Matt Chapman – 130th. Healy, Mancini, Nicky Delmonico, David Washington, Hunter Dozier and Mike Yastrzemski have had success in both AA and AAA this year. Author WeTalkFantasySportsPosted on June 3, 2016 June 8, 2016 Categories Stat CornerTags Alex Bregman, Amir Garrett, Beach Bum, Braden Shipley, Bradley Zimmer, Clint Frazier, Dan Vogelbach, David Dahl, Derek Fisher, FanGraphs, Harrison Bader, Hunter Renfroe, Jacob Faria, Jameson Taillon, Jeff Hoffman, Joe Musgrove, Josh Hader, Long Ball to LF, Matt Chapman, Nellie Rodriguez, Peter O'Brien, Ryan Cordell, Sean Newcomb, TBD, Trea Turner, Trey Mancini, Tyler Beede, Tyler Glasnow, Tyler O'Neill, Willson Contreras, Willy Adames1 Comment on What’s Going On Down in the Minors? Clayton Kershaw went for $117 — or 23.4% of a total team budget– at auction and was totally worth it. He’s that good. But there are a bunch of other players on the opposite end of the cost spectrum who have been good as well. Not Kershaw good, but good. And at $1, they’ve proven to be steals. The cool thing about dollar players is that the team who nominated them can bask in all the credit. It’s not like a $20 player where five teams were in on the bidding but only one won and gets to look smart. Getting a borderline top-50 starting pitcher for a buck is just unreal value. His numbers aren’t particularly good though. He’s striking out just 5.43 batters per nine, walking 4.21, and has posted a FIP/xFIP slash of 4.39/4.59. Basically, he’s been super lucky and he’s getting by without particularly good stuff. But hey, he costs a buck! As of this post, first place Team Canada has only started him three times, so he’s clearly not being relied on too heavily, which is exactly what you want for a guy like Perez. The Mariners’ platoon outfielder was the fourth-to-last player auctioned and at just $1, has rewarded Hustle Loyalty Respect handsomely. Smith has been in HLR’s lineup 14 times to date and has hit at a rate of 4.88 points per game in those opportunities, which is a better than league average clip. He’s a really good bench option. Brandon Drury has thus far been one of the best values in the league. Not only has he hit the hell out of the ball, but he can play three positions. At the absolute worst, he’s a flexible bench player capable of being deployed on days where better players are out. But the Loomps have started him 30 times this year, so he’s played his way into a key role. Having said that, he’s only hit at a 2.68 points per game rate over the last two weeks. Even if he cools though, he’s still been worth every bit of that dollar investment and with all that positional eligibility, he can still deliver value even if he hits at right around replacement levels. Jake Lamb has been on my prospect radar for a while now, so it’s cool to see him getting playing time and making the most of it. For just a buck, TBD has gotten an every day third baseman that is currently outscoring Todd Frazier, Miguel Sano, Adrian Beltre, and Evan Longoria. Like his Diamondbacks teammate Drury above, Lamb is certainly one of the best $1 buys and one of the better values of any dollar amount leaguewide. The shortstop position is no longer as weak as it was, so coming into this year there were a few savvy teams who opted to punt the position knowing that they could come away with a good option for cheap instead of paying a position premium. Hydra didn’t necessarily do that, as they dropped $23 on Marcus Semien at auction, but Cozart made him expendable and their team is better for it. Cozart won’t wow you most weeks, but at such a negligible cost, he’s proved a really valuable piece to a team vying for a playoff spot. Okay, I realize this looks bad. The Orioles’ international signee has barely played and, in fact, Dan just scooped him up from free agency after the owner who won him at auction opted to cut bait. But the reason he’s here is twofold. First, there isn’t really a better option on this team. And second, if there’s one owner in this league who I think is capable of recognizing a potentially valuable player that can be had for free and then have the patience to sit on him, it’s Dan. Kim hits when he plays, it’s just a matter of opportunities. On this roster, there’s a good chance he’ll just linger until those opportunities present themselves, at which point value should follow. Jean Segura has cooled off considerably from his hot start. Over the last 21 days, he’s been only the 31st ranked shortstop and is hitting at a below replacement level points per game clip. But the first few weeks to his season were insane, illustrating the potential that’s here. You could argue that Segura is the biggest reason The Foundation is 4-4 and not below .500, and in that regard he was definitely a dollar well spent. Admittedly, it’s weird choosing a reliever. But the only other viable option here was Lonnie Chisenhall, and I actually like Reed more. I’m not a big believer in spending big to build a bullpen, so Reed is pretty much exactly what you want: a cheap guy that performs comparably to guys who are paid well. As a top-25 reliever, he’s tremendous value at a position where spending a lot doesn’t seem advisable. Mike Foltynewicz has only started six games and he hasn’t been particularly good overall, but four of those starts were quite good. Two of them were toxic. The former top prospect is young and still developing, so you need to be cautious about deploying him. In other words, if you’re using him as anything more than your emergency seventh starter, you’re probably not going to fare too well. But for a buck, I really like the risk and the potential for reward. Finally, it appears Michael Saunders is healthy. That’s always been his bugaboo. When on the field, he’s always performed well, though right now he’s experiencing a true renaissance. And at just 29-years-old, his low cost and great production suggests plenty of future surplus value as well. This team does not have a single $1 player on it. That doesn’t mean they don’t have any good values. Just no good values for a buck. Um… is this a trend? Remember, we’re going in standings order. Suffice to say, if you do not have a $1 player on your roster, period, you will lose. Let this be a lesson to you. John Jaso rules. Like Saunders above, he’s always been a really good player, he’s just struggled to stay healthy and put full seasons together. To date, his on-base percentage is a cool .369 and he’s a .362 guy for his career, so he’s basically just doing what he does. He lacks the power you want at 1B, probably, but when you’re walking a lot and barreling up base hits, you’ll take it. In fact, it’s the lack of power that makes guys like Jaso sneaky valuable in this league. While teams are targeting the big home run hitters because they’re capable of dropping 30 point games, guys like Jaso, who will just quietly put up above average weeks without the long balls, will slip through the cracks. Andrew’s thoughts: The logic here is pretty simple: Beach Bum had too many outfielders and was relying on Jed Lowrie and Adeiny Hechavarria at short, while TBD has Corey Seager and a need at centerfield. By executing this deal, both teams fill a need without exposing any roster weaknesses. So good job. Troy Tulowitzki is interesting. He was good last year but significantly worse than he had been in his career and he took a considerable dive moving from Denver to Toronto. He’s been atrocious this year, though a .190 BABIP probably plays some role in his shoddy numbers. His .164 ISO is actually up a few ticks from last year. I can totally understand moving on from Tulo though, as it looks like even at his best he may just be a fringe top-5 shortstop play as opposed to being the undisputed kingpin at the position. Long term, Tulo doesn’t look like a guy Dan keeps beyond 2016, and that’s fine. If Charlie Blackmon gets traded out of Colorado to make room for David Dahl, it’s conceivable that he doesn’t get kept either. Short-term, win-now moves are fine and as I said, this one has the hallmarks of that type of move. Both sides are better. Big picture, I do like the risk here for Beach Bum. On a day to day basis, he’ll be deploying Matt Holliday instead of Blackmon, which strikes me as a lateral move. No harm, no foul. Even broken Tulowitzki is better than Hechavarria, so there’s that. Jordan’s thoughts: I really do not have much to add to what Bailey’s already said. It is a win win deal for both teams. At this point, I figure Blackmon to be worth more going forward, but it should shock no one if Tulo regains some momentum before 2016 is over. I find both players to be questionable at best for keeping in 2017. Both teams fill a need by sending from a position of abundance. I’m surprised more deals like this have not already sprung up in various areas. What the hell are projections good for anyway? Every year before the season starts, for a few baseball fans words like ZiPS and STEAMER and PECOTA among others become very popular. And then April happens and we forget all about them. Before the season started I created a document using the Depth Charts Projections from FanGraphs. This document took the best possible line ups based on those projections for each team and spit out a best case scenario of what teams could expect to end up finishing. I used this for my post-draft analysis. We are now five weeks finished, 25% of the of the regular season done. How have those projections done? Most notable takeaways: Capital City has had some awful luck with Carlos Carrasco and Tyson Ross going down. Haddy’s team is awfully under performing, Team Canada has a lot of things going right, and despite not winning any weeks, In Line 4 the Win has been way better than advertised. It’s been five weeks, projections tend to be what they are, but it is pretty interesting. It doesn’t really mean anything, we play in a head to head weekly league so results vary even more. But, I think its important to note that in just five weeks the best looking teams can get ugly and vice versa. I think what we can take from this is that we’re so far from started, not near being over. The question has come up: when will the first team bail? I think in another five weeks, the standings could be a bigger mess. I would stick it out. All players acquired through the minor league draft are cost controlled eligible. They are free to keep until after their first MLB season. 6th off-season: Graduate to Major League Keeper eligibility. In the fifth round of this year’s inaugural minor league draft, following a trade with Beach Bum, I took Colorado Rockies shortstop Trevor Story. He was my primary target at the time of the trade for reasons I’ll get to, but I thought I could trade down, add a higher pick later, and still get my guy. Luckily, I did. Anyway, he’s an interesting prospect in an even more interesting situation. In short, Story’s a power hitter with a whole lot of swing and miss in his game. He’s a bit like Ian Desmond in that regard. He plays a tough position to fill too, and now that he’s won the starting gig, plays in the most favorable fantasy park in the game. The guy presumed ahead of him, Jose Reyes, is likely to be suspended and even if he’s not, he’s yet to join the team. And the Rockies didn’t seem to like Reyes too much anyway. When I drafted him, I did so gambling that a few dominoes would fall. First and most importantly, that he’d earn playing time. With Reyes’ legal issues, I knew he’d be mostly out of the way through spring training and the Rockies didn’t look to me like a team plentiful with options. They could’ve signed Desmond, but that never felt like a viable fit to me. So first, I picked him hoping he’d get ABs sooner rather than later. Next, I obviously love the park. Who doesn’t want their fantasy players taking the field 81 times at altitude, where pitchers can only serve them meaty fastballs? My logic was that at the absolute worst, Story’s skill set lends him to being roughly average at home. Unless you have an elite shortstop, average is valuable. And because he’d cost me nothing in 2016 and a buck in 2017, an average starting shortstop meant I could punt the position at auction (which I obviously did). The last thing that led me to Story in our draft was his projections, specifically how ZiPS pegged him. ZiPS generously projected him for a .244/.308/.441 slash line with 18 homers and a .322 wOBA. That’s pretty good at a weak position. To lend that some context, here are the qualified shortstops who had higher wOBAs in 2015: Xander Bogarts, Troy Tulowitzki, Brandon Crawford, Jhonny Peralta (also on my team!). That’s it. In 2014, only Hanley Ramirez (no longer a shortstop), Peralta, and Starlin Castro and Ian Desmond, whose shortstop eligibility expiration date is rapidly approaching, had higher wOBAs. So basically, I saw a guy that ZiPS was projecting as a top four or five player at a weak position. Admittedly, I viewed these projections as optimistic. But even if you take some of the helium out, you’re looking at a serviceable player. Marry that to the other stuff — limited competition, opportunity, ETA, a dream of a ballpark — and this was a very enticing player at draft. That brings us to this past Monday. But with Story, it sort of was that simple. I drafted him for this exact situation. I like Marwin Gonzalez and Wilmer Flores just fine — in fact, they’re bad asses against lefties — but these aren’t every day guys. How bad would Story have to be to be worse than a guy that isn’t in the lineup that day? So I called him up and put him in my lineup. For the first time in the very young history of our league, a player drafted as a minor leaguer was in a starting lineup. And he hit two homers. And another the next day. And another the day after that. For a player that costs nothing, it’s been a fun half week. But it’s still just a half of a week. It’s totally conceivable that he stops laying into hangers and starts striking out at a 35% clip. There’s always a hitter that tears through the league for a week, then descends back into anonymity. For now at least, the plan is unfolding about as well as I could’ve wanted. I wanted this player and got him, and the dominoes that needed to fall have fallen. Now I just need the toppling to continue for another five or six months. ICYMI: Review of last week! Last week was a busy week for Dynasty Grinders. As of today we’re now a full week removed from auction draft day. That 8 hour marathon was capped off this week by reviews, thoughts, notes and a monster trade. If you missed any of it catch up below! The Auction Draft is Over! – Jordan writes a post last Sunday reflecting on the his immediate thoughts post draft. Where was the value at? – Jordan follows up with a post looking at where the auction value was left in the draft. Or maybe where it was not. Trade: Beach Bum | Rocky Mtn Oysters – Andrew and Jordan break down a minor yet fun trade. The Best of What’s Left – Keith of We Talk Fantasy Sports reviews what could be found on the waiver wire/free agent pool after the 480 selection draft. Some thoughts about my team… – Andrew reviews his draft and breaks down his own team point by point. Trade: Rocky Mtn Oysters | Preseason Double Stuffs – Andrew and Jordan break down the first major trade of Dynasty Grinders history. Fun with similar price points… – Andrew looks at the draft again to compare players bought at the beginning and end of the draft showing how the nomination order probably played a large role in determining some players values. Bryce vs Max part duex – Jordan takes a second and likely final look at the biggest trade of the week. Compares the two players’ 2015 campaigns on a week by week comparison. Team by team auction draft review and rankings! – Jordan kicks off his team by team auction review with a primer.